Made in the USA and pre-seasoned at our TN foundry, they boast a natural, easy-release finish right out of the box. Lodge Seasoned Steel pans are made of 100% carbon steel that can take the heat of professional kitchens as well as open fires at the campsite, and are the right tool for any culinary aspiration. A new spin on a classic design, this dual-handled 10.25 inch seasoned cast iron pan is perfect for everyday cooking, from morning pancakes to roasted chicken dinners. Lodge is proud to have designed a limited editon, designed in Canada, produced in the USA cast-iron skillet. This 10.25 inch skillet represents Canadian Imagery with the Iconic Loon Scene. Synonymous to Canada, Commemorating Lodge's long history providing USA made exceptional cast-iron cookware for the Canadian Consumer. Allowing for exceptional even heating quality with advanced metallurgy to create a safe and easy to use skillet to cook a vast range of recipes. We hope that you will enjoy cooking in these well made skillets as much as we were in designing and creating them! Seasoned Steel 15 inch Skillet As a natural compliment to cast iron, Lodge crafted the Seasoned Steel line with its core customers in mind. 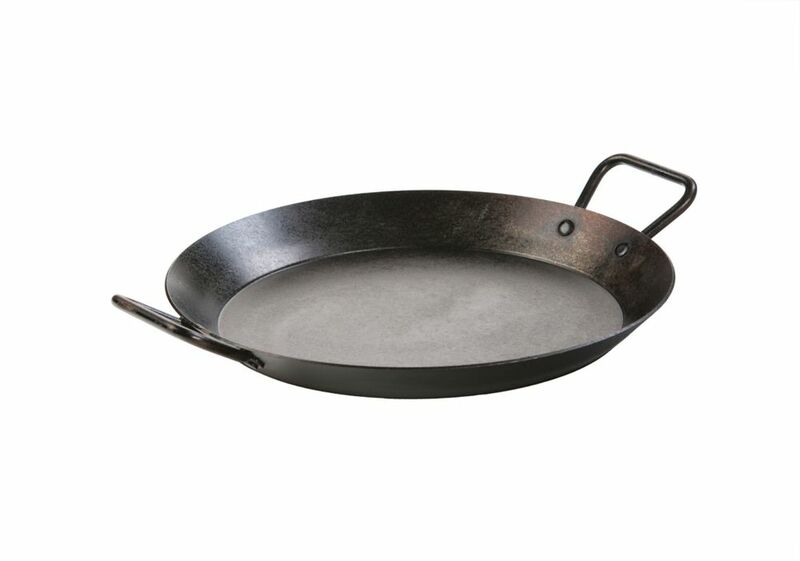 Seasoned Steel 15 inch Skillet is rated 4.7 out of 5 by 7. Rated 5 out of 5 by JSL from I have had this pan for a couple of years now, and without a doubt it is easily the best, most du... I have had this pan for a couple of years now, and without a doubt it is easily the best, most durable pan for outdoor cooking on my gas grill, on either the grid or the side burner. I have also used it inside on my glass top stove with equally great results. Treat this pan like you would any cast iron product. And clean up is as easy as with a teflon pan. I use kosher salt as an abrasive if needed and wipe it out with a paper towel. Everything I cook in it turns out great. Hamburger, steak, salmon, etc. Get one, you wont be disappointed! Rated 5 out of 5 by Danita from It's awesome - I used it outside on the charcoal... It's awesome - I used it outside on the charcoal grill to make paella - perfect!